Conroy's Old Bar - The World's 1st Self Catering Pub ! Available to rent 365 days of the year. & Reviewed by the UK's Guardian Newspaper. Perfect for family holidays, where spending "quality time together" is important, whether it's playing board games, hunting for fairies in the fairy garden, playing shops/landlord/landlady with the original till full of real money or perhaps even holding your own darts tournament, there's something for whole family. Perfect for a couples relaxing get together, where you can switch off, wind down and relax in this rural haven, just chilling out in front of the fire, or perhaps out in the garden having a BBQ, there's nothing better than having a proper catch up with good friends. which no longer holds a liquor licence and is completely "dry" of alcohol, making it the perfect quirky holiday accommodation for families. self catering holiday/vacation accommodation, where time has literally stood still. 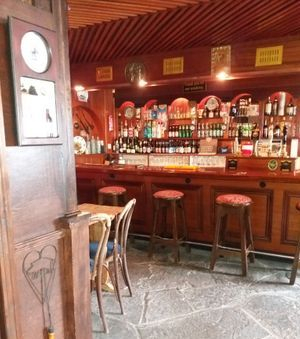 Conroy's Old Bar is a traditional Irish rural village bar, that has been lovingly and discreetly converted whilst retaining all of it's charm and character. Especially suited to those who have a love of the great outdoors; who would like to experience the true beauty and tranquillity of rural Ireland's Hidden Heartlands, whilst staying in an authentic Irish former village pub, where time has literally stood still. 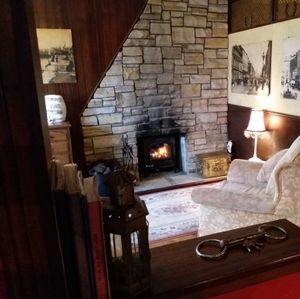 Situated a short drive from Lough Derg & the River Shannon. So much so, that we advise our guests to keep the chain on the door; otherwise you could find at the bar, unsuspecting passers by, who are looking for a pint of the black stuff ! highly polished mahogany bar, bar pumps, optics and the original till, has discreetly hidden behind it the fully functioning kitchen, where you can rustle up your own "bar food". One comment our guests make time and time again is how they love having "breakfast at the bar". The bar area is also home to the dart board and the skittles game. is the perfect place to relax after a long day of taking in what this beautiful Lough Derg & R.Shannon region of rural Ireland has to offer. There's also all the modern day conveniences (tv, dvd, stereo etc) although once again, they are discreetly hidden away. just off the lounge you will find the old snug, the perfect place for a good nights sleep, a cosy double bedroom with en suite wc. has retained its sloping floor; to aid the moving of the barrels and also it's original beer barrel delivery door. Just off the back hall you will find the shower room, with a shower big enough for a whole hurling team ! The back door to the garden and covered smoking area is also off this hall. You will also find Conroy's Old Bar has full central heating, and a washing machine. All linen, towels, electricity and fuel for the fire are provided *free of charge. (*fair usage limit). 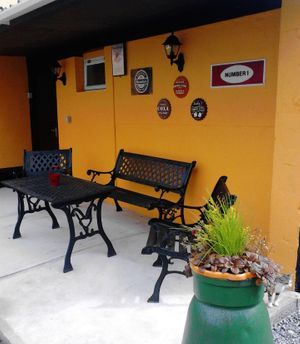 The large garden, has numerous seating and BBQ areas with views over the Tipperary countryside. There is also a selection of outdoor games; football, badminton etc, along with a couple of fishing rods, should you wish to try a spot of fishing on the near by Lough Derg or River Shannon. To the side of Conroy's Old Bar you will find off road parking. which is available for you to enjoy at your leisure. 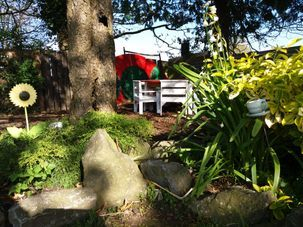 (the current upgrading of the Fairy Garden is due to be completed late spring 2019). 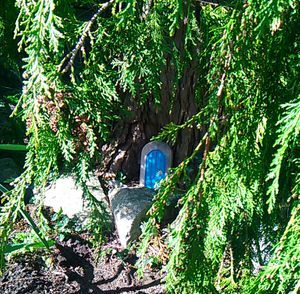 Children can while away the hours discovering the real life homes of the Fairy Folk. They can play outside Milo Burrows Hobbit Hole, sail away in the Leprechauns Pirate Ship, or design their very own Fairy doors on our huge chalkboards. Conroy's Old Bar is very family friendly. Cot's, bedding, high chairs etc, and a selection children's dvd's are all free to use and are available on request. When booking a family stay, please notify us of the child's/children's ages, so we can make sure age appropriate equipment, bedding, toys dvd's etc are available. Being all on one level makes Conroy's Old Bar friendly to those who may be slightly infirm or have trouble with steps/stairs. The shower is large enough to place a chair into, if it makes life easier, which we are more than happy to do. Unfortunately it has to be said that Conroy's Old Bar is not very wheelchair friendly, due to a couple of narrow doorways. Anyone wishing to book Conroy's Old Bar, who has specific requirements, please feel free to ask and we will do our utmost to accommodate. 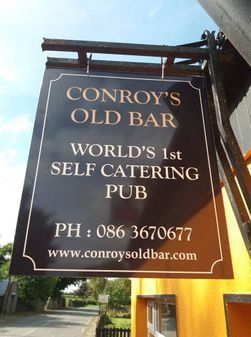 Conroy's Old Bar will be ready for you on your day of arrival from 4pm. Please give us a "rough idea" of your expected arrival time, no later than the day before, so that we can arrange our working day to be available to meet you in Conroy's. We will then give you a few pointers on the more quirky elements of Conroy's, that will hopefully make your stay a more memorable one for all of the right reasons, before leaving you to enjoy your stay. On day of departure we ask all guests to depart by 10am. Being situated in the centre of Ireland means Conroy's Old Bar is no more than a 2hr drive from any of the major cities. 50 Amazing Places to Stay Around Ireland. We're delighted that our little Pub With No Beer has been chosen by The Irish Times to feature in their latest publication of "50 Amazing Places To Stay Around Ireland". If you'd like to take a look, check out this link. You'll find Conroy's Old Bar featured in the "For Romance" section (37). 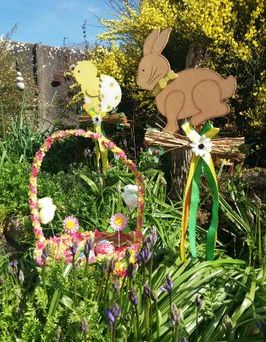 The Fairy Garden is currently being upgraded with new fairy folk arrivals and is due to be completed by late spring 2019. Conroy's has recently had a new solid fuel stove installed. This not only makes controlling the fire a lot easier, but it also makes it a lot cleaner to use and SO much warmer !